Are you worrying if you will ever marry? Are you divorced and wondering whether you will marry again? 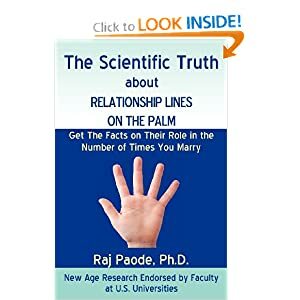 Dr. Paode's research on relationship lines on the palm can address your concerns about your marital future. It clearly proves that these lines impact marital frequency and can provide a range of the number of times you can expect to marry. - The location of relationship lines on the palm. - The technique for identifying and counting relationship lines. - Which palm (left or right) to use for enumerating these lines? - How to calculate the most probable number of marriages from the lines. - The method for estimating the maximum marriage frequency from the lines. "In the research itself, 5% of the individuals had married more times than the forecasted maximum marriage frequency. So have fun reading this book, and don't take the marriage numbers results too seriously." Unfortunately, the introduction does not reveal how many of the individuals had married less than the forcasted frequency; this doesn't look promising so far too me, because people tend to have more relationship lines than marriage... and Dr. Paode's study all people who have no relationships lines were excluded!??? So, I think one can not draw any conclusions from the 5% mentioned. And I also noticed that all 3 professors who have endorsed Dr. Paode's work, have a background in engeneering sciences - not in the social sciences. I'd really like to see more of it but what you say makes me think.. should I waste my time? after all relationship lines don't automatically result in marriages.